The VIX, however, is up nearly 4%, and Goldman Sachs is down another 3%. CAT, whose revenues fell 11% from the “bottom” (quarter 1 of 2009), is back nearly at 2007 prices after having its first profitable quarter in the past seven! Price to Earnings ratio? Only 50, that's all. North American sales? DOWN 15% year over year. This mirrors another manufacturing bellwether, Boeing (BA), who reported revenues down 13% quarter one of this year over the same quarter the year prior. Current P/E of “only” 45! A buying opportunity that can’t be passed, or an extreme in sentiment and valuation? This Friday the Wall Street Journal reported that NYSE 52 week highs reached 634, a high that dates back to 1982. Some (uninformed) market callers say that this is a sign of strength showing great breadth in the market. I say it shows an extreme, one that is almost always seen near major turning points in the market, let’s examine the history. Let’s examine this chart carefully. Note that in late ’07 there was a cluster of 4 events with readings over 300. What followed? One of the greatest stock collapses in history. 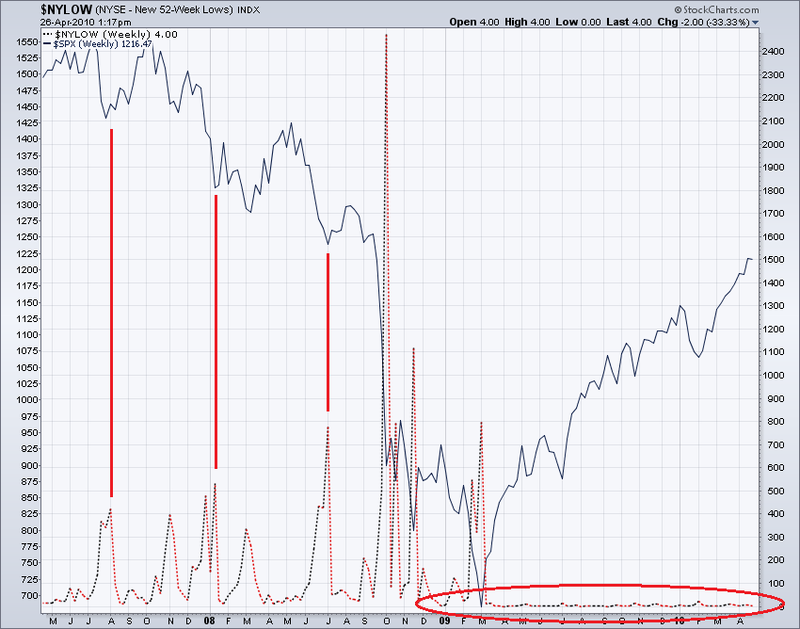 Note how the peaks in the new highs correlates with tops, certainly not buying opportunities, that’s for certain. 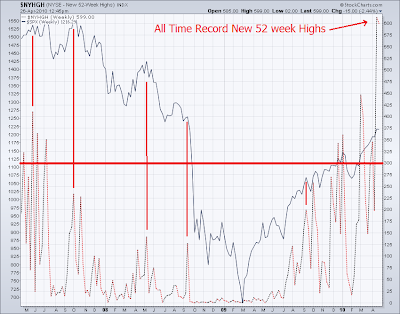 Those extreme readings reversed, the number of new 52 week highs went to near zero and stayed there as the market bottomed. Now that the market has literally been climbing uninterrupted for over a year, the number of new 52 week highs has hit insane and never before heard of levels. We just experienced our 5th weekly close over the 300 level in the latest cluster, culminating in an extreme just as the markets reach their 200 week averages and their inverted Head & Shoulder targets. 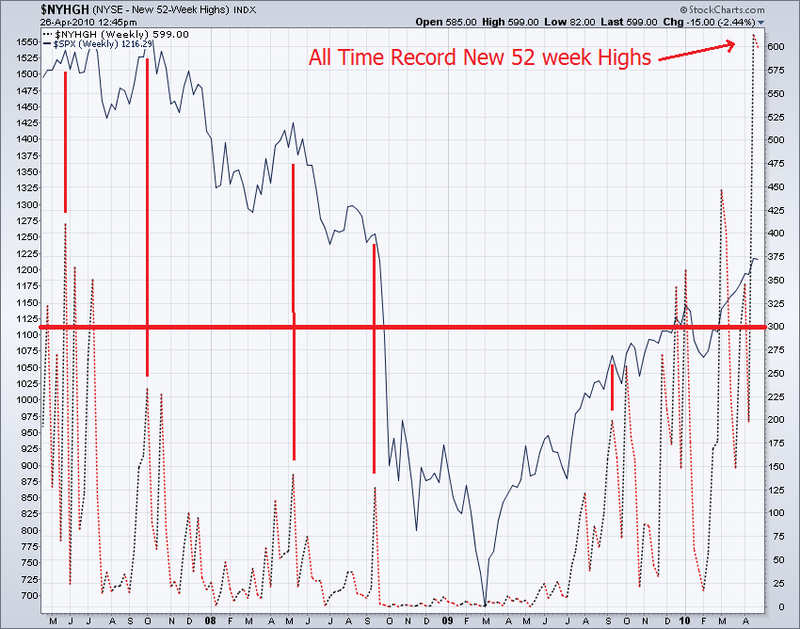 Now let’s examine a chart of new NYSE 52 week lows for comparison. 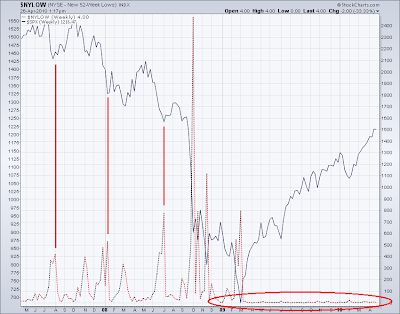 What’s immediately clear is that there is a distinct correlation between peaks in new lows and bottoms, probably one of the best correlations you’ll find. As you move across the chart, you’ll see a spike in the number of new lows at the March ’09 bottom and it has flatlined near zero ever since. This is not a healthy condition, it is an extreme! It’s true that as the number of new highs tilts strongly in favor of the bulls that it shows a breadth and a desire for the market to rise – the same is true for new lows when a market is moving lower. Extremes, however, show a lopsided flow of money. This lopsided condition reaches a point mathematically when it HAS to reverse! This is due to the fact that as more buyers enter the market, you have more and more money and sentiment bringing buyers in until the last buyers enter… at that point there is no more new money to take prices higher. The opposite is true on the way down. We are definitely seeing those types of extremes now. However, beware that major turning points take time to develop, so be patient and do not expect instant crash – look at those charts and how long it took for a meaningful and sustained change of direction to occur. It's clear that it takes clusters of extreme reading to turn the entire market direction, while a single high reading can indicate a correction. We've seen a cluster of extreme readings now, haven't we? I am often asked about Hindenburg Omens. They are triggered when certain market conditions exist AND the number of 52 week highs and lows are BOTH elevated. This happens very rarely and is a good indication that a substantial market decline is about to occur. In order to trigger another Hindenburg Omen now, it would require that the number of new lows rise to 85 or above while the number of new highs remains above that level as well. It’s not likely to happen until we get an extended decline because stocks now have a long way to travel to get to new lows. The Hindenburg works because it shows a market that is internally split, some stocks are doing great while others are doing poorly. 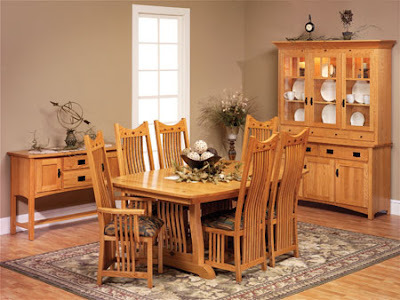 The most recent example was when housing and construction related stocks were making new lows yet the overall market was continuing to put in new highs into the face of that. Remember the sentiment at the time? The “experts” were saying not to worry while a select few, like myself, were warning that it would affect overall consumer spending and that eventually the rest of the market would follow. It did. This current “recovery” is not a consumer led recovery, it is a paper led false bounce, one that has bankrupted our nation and introduced new systemic risks that are only added to the prior risks which have not been allowed to clear. Ignore those new highs if you dare, I wouldn’t.